I know some of you guys have them. Will someone post details with a picture? A mate has lost two water pumps because of running with no wtaer. So i want to tell him what to instal. One way is to fit a ball valve switch in the tank, near the bottom. Ball valve up= water, ball down=dry. Alternative is a similar floating switch with a ball bearing; switch floats=water=on, switch 'flops' down =dry=off. pumping direct from the mains, which is illegal. Most plumbers should be able to fit one easily, but they'd need to see the tank. If pumping from a well you may need to replace the non return valve which is between the pump and water source in well, they regularly jam with dirt in them. I think the question was detection of/if a pump is running 'dry'? I have pondered this question often...mainly because of running toilets or a tap being left on...draining our tank. Never implemented as make it a point to listen for the domestic pump running before passing out at night. A simple solution might be a light or buzzer wired to turn on when the pump is running. Some well pumps have a thermal switch turning off the pump if overheating....they self reset when the pump cools down. There are flow detectors out there....this one is only rated 10W though. The pump on my rainwater tank has a pressure switch so it only powers on when it detects a tap is open in the house. It also automatically powers off if it detects that there is no water in the pump, say if the tank runs dry or the pump is not primed. Not my installation. It is at a mates factory. So rebuilding/buying new pumps is OK but I am an old maintenmace guy from way back so the solution is to stop the pumps when the water is low or there is no flow. Yeah the problem is when the tank/pit is low and the pump continues to run. There is a cheap plastic strainer/check valve in the tank I have been told that the brass ones are better. The other pump is down stream but basically relies on the first one topping up the postfilter storage. if the first one runs out of water!! So two systems with a small time delay. Need to protect both. This might work. It says though normally open which might be workable. The pupm would kick in on low pressure and this would then keep the pump on if there is flow. Might get a bit hitech though and as this is a favour rather than a job!! 10W OK just need a relay. Wire in a float switch, available at most bigger hardware stores. It will prevent the pump from running when the water level drops to or just above the suction point, you can adjust it by tying off the wire line to the correct length. That will work for one but not the other as it is fed from essentially a sealed vessel downstream of some filters. It has no top access. 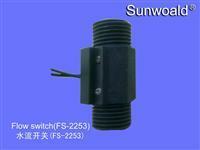 The same can be acheived in an open tank with a 24v system, two wires and a relay. Didn't belive it when I first saw it but it had been there and working for about 20 years. OK with the engineering but thanks for the offer. I maybe late to answer? And I am new to this forum. He destroy 2 water pumps? Your friend can use as many water pumps as ever. They are made for purpouse.